This 'Baseball' Style satin jacket is a great alternative to your basic line jacket. Even add satin stitching around letters - it provides a solid border of thread around your letters that adds an extra 'POP'! Tell us which colors you want for your letters and backgrounds. 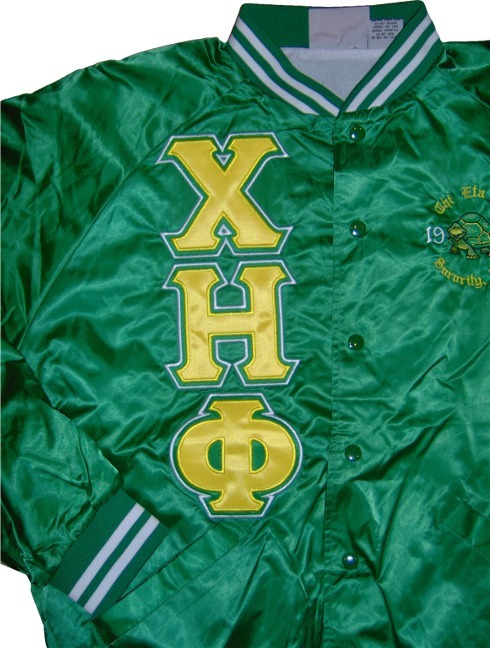 *SHOWN: Kelly green with white stripe jacket color; yellow letter color; Kelly green letter BACKGROUND color; white satin stitching around letters; sorority name arched with year; satin stitch coloring - yellow around yellow letters, white around green backgrounds.